Trees, shrubs, and vines are used for bonsai. For plants to become bonsai, they have to be dwarfs of their mature- sized counterparts in nature. Miniaturization of leaves, needles, limbs, and roots is accomplished most effectively by pruning. Root-pruning, which also keeps the tree fitting in a small container, plays a big part in keeping the whole tree small - a mirror effect. An equally important visual feature is a mature trunk plus exposed surface roots which mimic an ancient tree where soil has eroded away. When you are ready to shop, for quicker results, choose plants that have naturally small features. Especially, choose plants with small flowers and fruit for an overall miniature look. Plum and Crabapple trees are sometimes seen as bonsai with their mid-sized fruit in contrast to their miniature trunks and leaves - an exception. Choose a plant with bright berries or small flowers like Crown of Thorns, Pyracantha or Flowering Quince for an interesting start to your collection. Many azaleas have small or moderate sized flowers. Some hybrid azaleas in recent years bloom up to three times a year without adding fertilizer when planted in a rich, acid mulch of bark and oak leaves. For conifers, the Dwarf Japanese Juniper and Shimpaku Juniper are sure starts to success in just a few training sessions. The four seasons can be appreciated in bonsai with deciduous trees, shrubs, and vines. 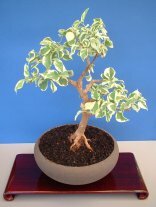 Bonsai training gives a plant the look of antiquity through illusion; older plants can be trained into bonsai, and in special cases of care-giving, bonsai can live to be hundreds of years old. To study and make your own bonsai design can be interesting, experimental, fun, challenging and rewarding...even peaceful. WINTER MONTHS. A PORCH, OPEN GARAGE, OR CORNER NICHE CAN PROTECT THEM FROM HARSH WINDS AND COLD. ALSO, YOU CAN PLACE POTS IN A GROUPING IN A MULCH BED AND RAKE THE MULCH UP AROUND THE POTS. LARGE BONSAIS WITH A 20" DIAMETER OF SOIL ACROSS AND DEEP SHOULD BE OK IN A MORE EXPOSED AREA AND CAN BE WRAPPED IN A TARP DURING A FREEZE IF IN DOUBT. FLORIDA AND COASTAL AREAS TROPICAL WEATHER OFFERS MORE FLEXIBILITY FOR GROWING BONSAI OUTSIDE. SALTWATER, SALT AIR, AND BEACH SAND MAY NOT BE COMPATIBLE WITH MOST PLANTS LISTED HERE. LOOK FOR INDIGENOUS PLANTS AT LOCAL NURSERIES. MIDWESTERN AND NORTHERN U.S., CANADA BONSAIS NEED GREENHOUSES, COLD FRAMES, OR GLASSED-IN PORCHES FOR WINTER PROTECTION, AND CLIMATE IN THESE SETTINGS WILL NEED TO BE CONTROLLED TO MAINTAIN PLANT DORMANCY THROUGHOUT THE WINTER SEASON. WHEN PLANNING A LOCATION FOR GROWING BONSAI, PLEASE CHECK YOUR CLIMATE ZONE & CONSULT YOUR LOCAL NURSERY PROFESSIONAL. * Must come indoors in temperatures below 50°. Needs good light from a window or grow light. † Can spend time outdoors in temperatures above 50°. Kurume Azalea with a medium sized flower. Crown of Thorns flowers are about one half inch wide. The plant is fast growing - a good stock choice for making bonsai.